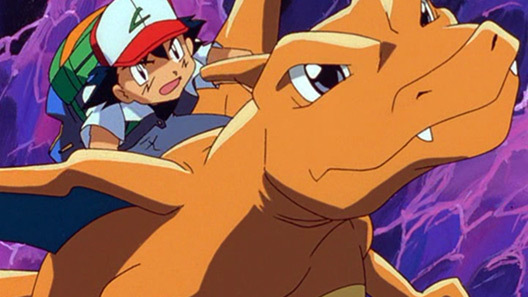 This may sound a bit hyperbolic, but Pokemon 3: The Movie felt like the end of an era. Now, Pokemon’s popularity hasn’t exactly waned at all in the years since the film’s 2001 release (it’s still the biggest merchandise seller of any franchise in any medium, and the games remain best-sellers to this day), but this seemed to mark the end of the world’s initial Pokemania, when Pokemon was an inescapable phenomenon. This was the last Pokemon movie to have a wide theatrical release in the United States (subsequent Pokemon features were relegated to select theaters, before receiving the straight-to-video treatment), and it also seemed to be the point when “pet monster” anime was dying down a bit (even Digimon – the closest thing Pokemon had to a rival – fell off the radar with its third season). Pokemon’s fading omnipresence could be seen in Pokemon 3: The Movie itself, as it wasn’t anywhere near the box-office success of its predecessors. Maybe parents were tired of taking their kids to see Pokemon movies, or perhaps the dwindling box-office returns had something to do with the lack of new Pokemon in the movie, and kids didn’t have as much interest (it would be another two years before the third generation of Pokemon hit stateside). But Pokemon 3: The Movie’s relative unpopularity is a shame, as it might actually be the best of the three original Pokemon features, with strong themes and surprising emotional depth. Although the hero of the film remains Ash Ketchum, it’s hard to refer to him as the main character this time around. 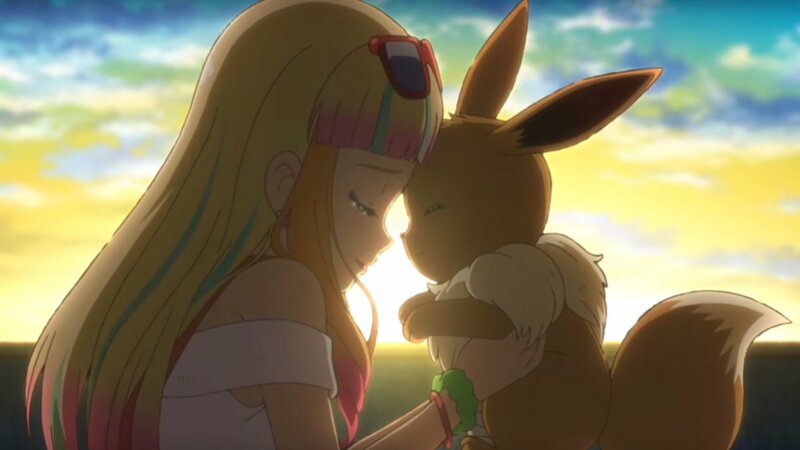 The young Pokemon trainer, along with his friends Pikachu, Misty and a returning Brock may be the stars returning from the show, but Pokemon 3: The Movie primarily focuses on a new character, a young girl named Molly, for its emotional core. Molly is the five-year old daughter of a research scientist named Spencer Hale, who conducts research on legendary Pokemon. During an expedition to study the mysterious, inter-dimensional Pokemon Unown, Professor Hale is spirited away to another world by the Unown. Molly’s mother has long-since disappeared (the movie never really mentions what happened to her), and now with her father gone, Molly is overwrought with grief. Her father’s assistant brings Molly an ancient, puzzle-like artifact as a memento from her father’s expedition. After tinkering around with the puzzle, Molly unleashes the Unown, who begin using their psychic abilities to bring Molly’s dreams to life. The Unown’s powers begin to meld with Molly’s grief, and soon she begins to alter reality to make her happy. The Unown turn her hometown into a crystalline palace, she can become a young woman at will, and most importantly, her father returns to her in the form of Entei, Molly’s favorite Pokemon. Within this illusionary dream world, Molly becomes delusional and reclusive, preferring the happiness of the Unown’s illusions to the sadness of her real life. One thing is still missing from Molly’s life, however; a mother. So Molly sends Entei to find a surrogate mother for her, which happens to be Ash Ketchum’s mother (Molly’s family are long-distance friends of the Ketchums). So Ash and friends journey to Molly’s manor-turned-fairy tale castle to rescue Mrs. Kethum and, hopefully, to help Molly out as well. 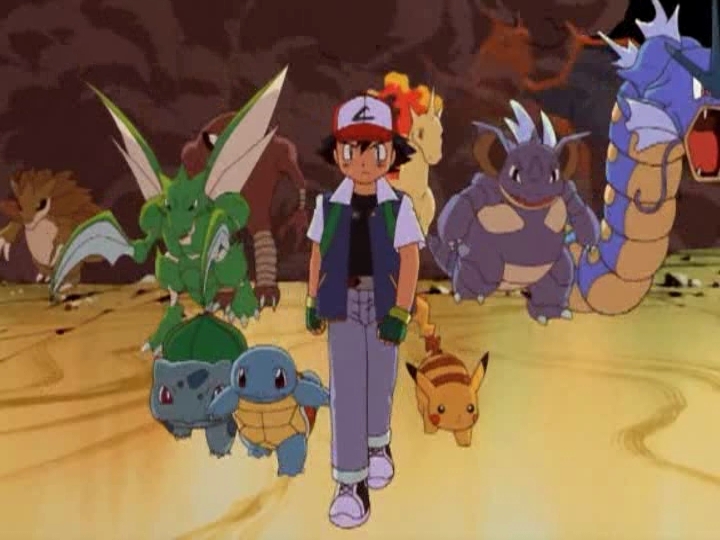 It’s a pretty simple plot, but it differentiates itself from its two predecessors by making the stakes more personal (saving Ash’s mom, as opposed to saving the planet from Mewtwo or nature falling out of balance), and with its emphasis on Molly, who is uniquely both the film’s protagonist and antagonist (okay, Ash is technically the protagonist, but this is Molly’s story more than it is Ash’s), it stands out a little more. Not to mention with its themes of loss, loneliness and grief, it’s perhaps the most emotional and deep of the original Pokemon trilogy. I mean, when the central dilemma of a film is a small child’s grieving, it’s hard not to get emotional. The focus on a new character is a little bit of a double-edged sword, however, seeing as Ash and the other returning characters don’t get nearly as much character development as they did in the second film. I suppose by the third entry you need a bit of a change of pace, but it should say something that Meowth makes a fourth-wall-breaking joke about Team Rocket’s minimized role in this film compared to the second feature. More on the bright side of things, the popular-for-their-time pop tunes that littered the first movie and had a presence in the second are nowhere to be found. On the downside, that may have been another indicator of the franchise leaving the public eye a bit at the time (having a popular band attached to Pokemon was great promotion back then). But I’d much rather here the cheesy-yet-indelible original songs of Pokemon than hear a distinctly yesteryear pop tune shoehorn its way in. Following in the footsteps of Pokemon: The Movie 2000, Pokemon 3 has a surprisingly strong original score. I’m not sure if any one track reaches the heights of “Lugia’s Song” from the second film, but its still an effective and memorable score nonetheless. Once again, the animation takes a step up from the TV show to better fit its presence as a movie. The characters move more fluidly than the TV show to be sure, though it does seem a little inconsistent within itself (sometimes the animation looks like a remarkable improvement, other times, merely an improvement). And like the second feature, we get some fun and varied locations to see, with the sometimes surreal world of Molly’s fantasies being a highlight, and making the first film’s focus on Mewtwo’s labs look even more bland in retrospect. Pokemon 3: The Movie – Spell of the Unown may not be a cinematic classic by any means – its structure is sometimes lacking, and certain plot elements feel rushed together – but it is a great reminder that Pokemon can be (and often is) more than the simple money-printing franchise it also very much is. I mean, how many more “legitimate” movie franchises have an entire feature about grieving, and trust that its young audience is wise enough to understand such a heavy concept? It’s a shame Pokemon 3: The Movie came at the end of Pokemania’s initial run. Despite its (sometimes quite obvious) flaws, its heart is in the right place. And if any of the subsequent Pokemon features shared its heart, then it’s all the more disappointing to see them relegated to the straight-to-video section. Go back to 1999. Pokemon dominated the Earth. The monster collecting video game franchise got its start in Japan in 1996, but by the time it made its way to the western world in 1998, the games had a wildly successful anime and a trading card game to go with them. And they all hit stateside at the same time, creating a pop culture phenomenon that I don’t think has been equaled in my lifetime. It’s not hard to see what made Pokemon popular: It’s ever-increasing roster of Pokemon give it a seemingly endless supply of cute and cool characters, its emphasis on collecting, trading and sharing makes it engaging, and its kid-friendly exterior hides a deceptively deep set of rules and mechanics, whether its in its original video game form or the other media that have spawned from it. Despite being a marketing goldmine (its merchandise sales exceed that of Star Wars even today), Pokemon was always more than that. As stated, the games were (and are) much deeper than they let on, and the TV series – though often lacking in structure, heavy on repetition, and having its share of cheesy moments – similarly made the effort to be something more. 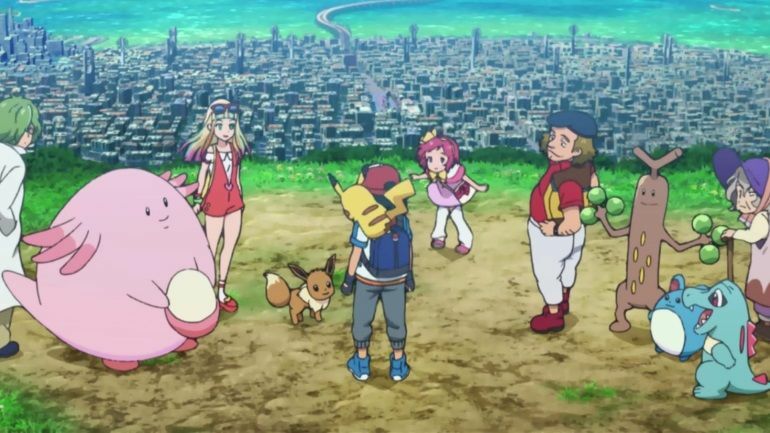 It’s shortcomings were still there, of course, but the Pokemon anime made many attempts at pulling at the heartstrings with its themes of friendship, love, and even loss. It wasn’t simply a fun little franchise, but something that really resonated with its target audience. A Pokemon movie was inevitable, and it arrived sooner than anyone could have guessed. Going back to 1999, a mere year after Pokemon made its way westward, the Pokemon generation was elated to see their beloved franchise make its way to the big screen. Pokemon: The First Movie – Mewtwo Strikes Back was a big deal in its day (it remains the highest-grossing anime film in North America, with only its immediate sequel coming close), and it remains a nostalgic treat for those like me who were at the center of Pokemania in 1999. Although I wouldn’t classify Pokemon: The First Movie as a great film by any means, I would still label it as something more than a mere guilty pleasure, seeing as it – much like the TV show – made the effort to be something more than the cash-grab cinematic transition it also very much was. 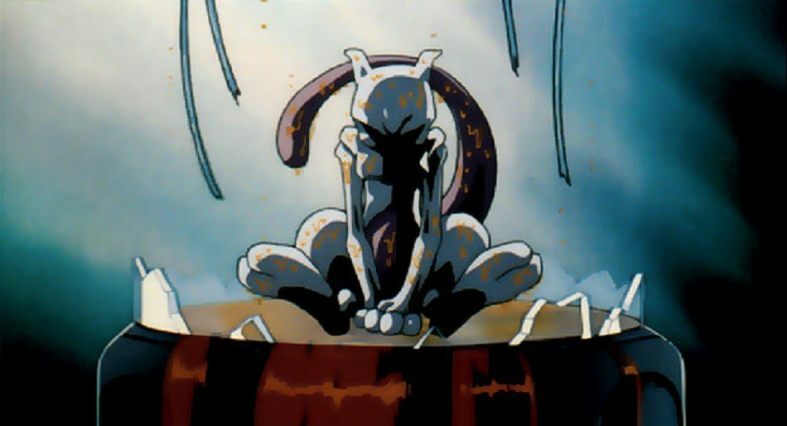 As the title makes quite clear, Pokemon: The First Movie centers around Mewtwo, the legendary Pokemon who was – at the time – the most powerful Pokemon of all. While most Pokemon are like animals, and the other legendary Pokemon are akin to mythological creatures, Mewtwo was engineered by humans in a laboratory, by means of cloning the “first” Pokemon, the legendary Mew. In the film, Mewtwo’s creation was commissioned by Giovanni, the mysterious leader of the villainous Team Rocket organization. 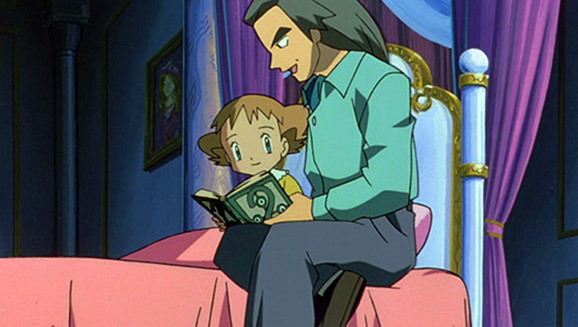 Giovanni manipulates Mewtwo to be his own personal weapon, but as Mewtwo gains greater sentience and begins pondering his existence, he abandons Giovanni in hopes of making a greater purpose for himself. Mewtwo plans on creating his own cloned Pokemon to inhabit the Earth, after he rids it of humans and the Pokemon of the natural world (beginning with a massive storm that Mewtwo is creating using his psychic powers). It’s a pretty heavy story for Pokemon, with the point being hit home when Mewtwo destroys the lab that created him (killing all the scientists therein) within the first few minutes. No one died in the TV series up to this point, so that shift in subject matter definitely made this feel like Pokemon the movie. Mewtwo decides to prove the worth of his clone Pokemon by posing as “the world’s greatest Pokemon master,” inviting trainers over to New Island to do battle. 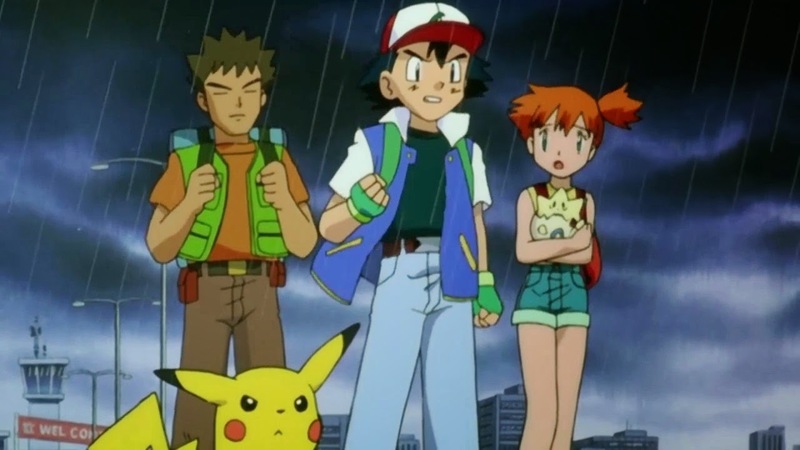 Among these trainers are the series’ original heroes Ash Ketchum, Brock and Misty. The trio – like the other trainers invited to New Island – are unaware of Mewtwo’s identity and of his clone Pokemon, and are only looking to test their Pokemon battle skills. When the trainers arrive and discover Mewtwo’s intentions, they find themselves trying to stop the legendary Pokemon’s plot. It’s simply a forced message that doesn’t really work with the movie that’s presenting it, and it’s made all the less impactful due to the climactic battle between Pokemon and clones being accompanied by a pop tune that’s only included for the sake of a pop tune, which only clashes with the movie. The Japanese version of Mewtwo Strikes Back better emphasizes the message of man playing God and its consequences, what with Mewtwo’s search for a purpose and all that. The English version may have benefitted both narratively and (perhaps) critically if it focused on that message instead of one that clashes with the nature of the franchise. There are also some notable flaws with the translated version, with at least three Pokemon being referred to by the wrong name (confusing Pidgeot for Pidgeotto and Sandslash for Sandshrew are at least understandable, but when Team Rocket refers to a Syther as an Alakazam, it’s a hilariously glaring error to any Pokemon fan). Though at the very least I suppose there’s a bit of nostalgic irony to be had with these mistakes, but you do have to wonder if the translators had any reference material to avoid such errors. 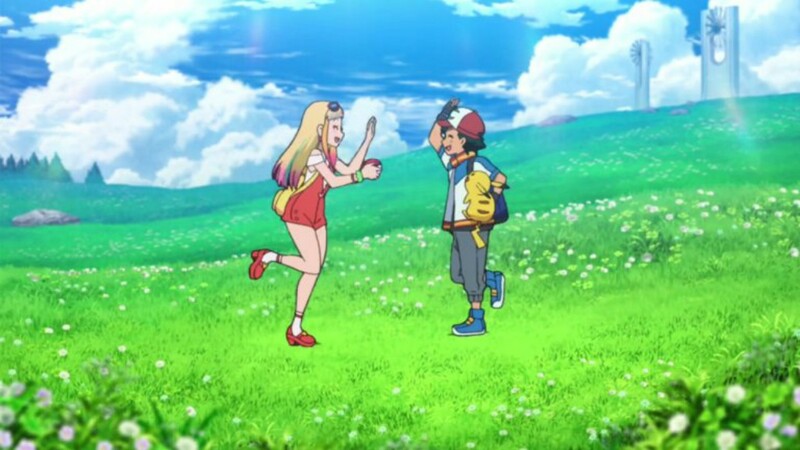 In terms of animation, Pokemon: The First Movie is of course an improvement over the TV series, with more fluid character movements and more detailed backgrounds. Granted, it still has its visual limitations, but in its stronger moments, Pokemon: The First Movie has that distinct “90s anime” look that has held up pretty well. And excluding the shoehorned inclusions of 90s bands such as *NSYNC, the music is actually not bad, and hearing that original Pokemon theme brought up to scale for a movie still gives me goosebumps. Pokemon: The First Movie suffers from some obvious flaws and shortcomings (including a brief running time, with the film’s theatrical release being accompanied by a Pokemon short film to add an extra 20 minutes). But what elevates it to being something more than a mere guilty pleasure of nostalgia for me are its attempts at emotional moments, some of which are actually quite successful. One scene towards the end in particular, is surprisingly effective. Hey, when Pikachu is crying, it’s hard to not get a little misty-eyed. In the end, Pokemon: The First Movie – Mewtwo Strikes Back is far from a great movie (its sequels – though flawed in their own right – were improvements), but it makes enough worthwhile attempts to be something more that it still provides some entertainment. Despite all the blemishes, Pokemon: The First Movie is still a nostalgia trip that I don’t feel guilty about taking from time to time. Super Smash Bros. quickly became one of Nintendo’s most beloved franchises. And how could it not? It’s a fighting series where Nintendo’s most beloved characters duke it out with sumo-style rules, and Mario Kart-esque weapons. But after the sequels built so strongly on the series’ formula, going back to the original may come us a slight disappointment. While the 1999 original Super Smash Bros. remains a fun game in its own right, it feels more than a little empty when compared to any of its sequels. As stated, Super Smash Bros. is a fighting game where – rather than depleting your opponents’ health – the goal is to accumulate enough damage to send them flying off the screen, thus eliminating them. It’s a simple enough setup, but it has proven so much fun that the series has produced some of the most insanely replayable games of all time. On the downside, much of the depth found in the gameplay wouldn’t arrive until the GameCube sequel, Super Smash Bros. Melee. Melee would add more moves, more specials, and tighter mechanics. Brawl would add Final Smashes and some really creative movesets. And the recent Wii U and 3DS editions add depth and polish to pretty much every facet of the gameplay. By comparison, the N64 original feels barren. Here, the characters only have three special attacks (performed with B, B + up, and B + down), as opposed to the four found in Melee and subsequent titles. Even more notably, the number of standard attacks each character has is incredibly limited. There are no Smash attacks or more intricate moves. You can’t midair dodge, or perform very many fancy combos. You only have a few directional ground and midair attacks, and the aforementioned specials. The gameplay is still fun at its core, but knowing just how much depth the sequels added to the equation, it’s easy to feel that the original Smash Bros. is a bit dated. On top of that, some of the mechanics also haven’t aged too well. Here, opponents will be sent flying off-stage with relatively little damage. In later entries, opponents usually need to be well above the one-hundred damage mark before you can think about sending them packing. But here, you can defeat enemies after having only dealt about half of that damage. This leaves many battles feeling incredibly short. Another downside is just how slow the characters move. Many people complained that the characters in Brawl moved too slowly, but I might assume those same people hadn’t played the original in a good, long while. Here, the characters move so slowly and jump so floaty it’s hard to complain about Brawl’s movements by comparison. 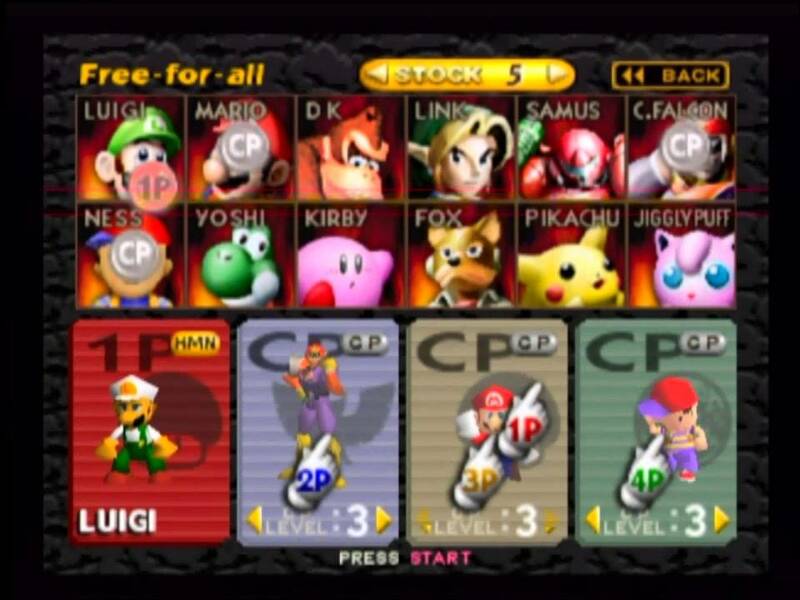 On the bright side, the original Super Smash Bros. featured an indisputable roster of deserving characters. From the get-go, players can select Mario, Donkey Kong, Link, Yoshi, Samus, Kirby, Fox McCloud and Pikachu, while the secret characters include Luigi, Jigglypuff, Captain Falcon and Ness. It’s an incredibly small roster compared to the sequels, but it also benefits by predating the clones, self-damaging characters, and seemingly random character selections found in later games. Every character here strongly represents Nintendo’s diverse franchises, and you can’t really complain about the the character inclusions (though it is a shame the low memory of the N64 meant that Princess Peach, Bowser and King Dedede were left out of the mix until later entries). Super Smash Bros. also featured a good number of fun items and a small but creative selection of stages, each one boasting their own gimmicks. There are also some additional modes to be found, though understandably, there’s not nearly as much content as there would be in future installments. Single player modes are limited to an arcade-style “story mode,” where you battle in a series of fights until you make your way to the Master Hand, and the mini-games Break the Target and Board the Platforms. They aren’t much, and once you’ve played through them to unlock the secret characters, you’ll probably be sticking with the multiplayer battles. 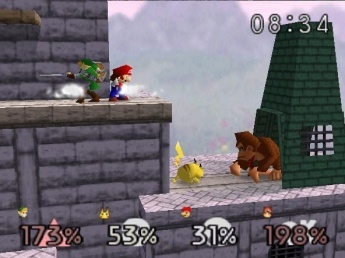 The original Super Smash Bros. is still a fun game, particularly with a full group of four players. But it doesn’t hold up nearly as well as any of its sequels. The game feels prototypical and a bit shallow, and it simply isn’t nearly as fun as Melee, Brawl or the Wii U and 3DS editions. It does hold up better than many of the other multiplayer titles on the N64, however. If you want to play a more definitive and deep Smash Bros. experience, stick to the Wii U version. But if you simply want to have some old fashioned, multiplayer fun, you could do a whole lot worse. Pokemon Go has seemingly taken over the world. Though it shouldn’t be too hard to figure out why that is. Pokemon Go simplifies the Pokemon experience and brings it to the fingertips of anyone with a cell phone. While that simplification does come at the cost of some of the series’ depth, it does make Pokemon Go an appropriately addictive app. Pokemon Go brings the Pokemon series back to basics, with only Pokemon from the original lot of 151 showing up in the game. The original 151 were always the most iconic, so no doubt they’re presence has helped the game’s universal appeal, while simultaneously providing a good dose of nostalgia for those who have grown up with the series. Players take control of a Pokemon Trainer, who is sent on their Pokemon-collecting adventure by Professor Willow. 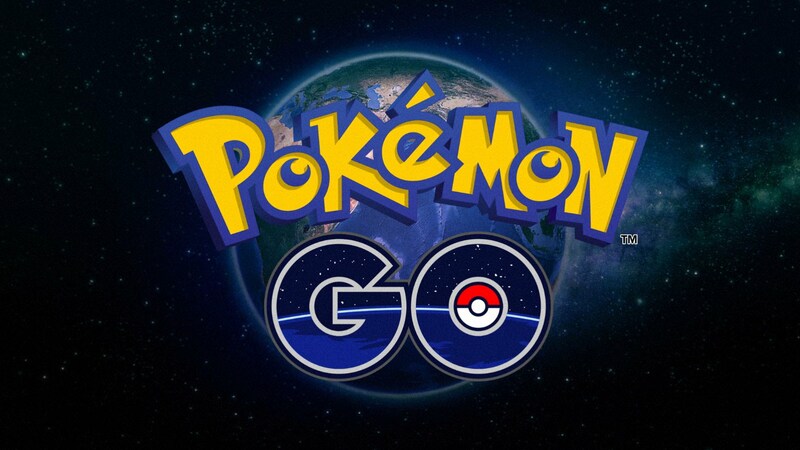 Where this adventure differentiates from the main series, however, is how it uses your phone’s GPS to merge the real world with that of the Pokemon games. By linking with your phone, Pokemon Go turns your neighborhood into the world of Pokemon. The titular creatures might show up in your own home, or you may go on a quick walk to find them. You may even find yourself going for a jog just to find a rare Pokemon nearby. Additionally, public buildings and local landmarks become either “Pokestops” – where players can get more items – or gyms, where players battle the current gym leaders to gain control of it for their team. The augmented reality is emphasized all the more when trying to catch Pokemon, as the game syncs with your phone’s camera to place the Pokemon within the real world. It’s an amusing feature, made all the more memorable by the ability to take a photo with the Pokemon in place (the closest thing we’ve got to a Pokemon Snap sequel). 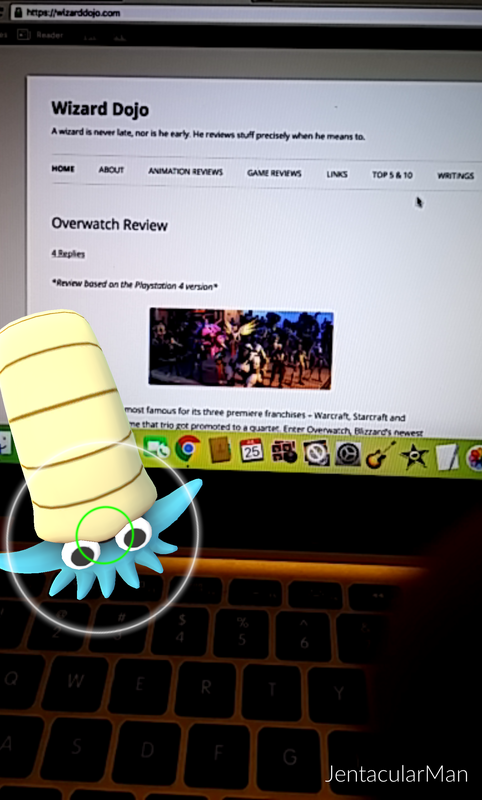 On the downside, the augmented reality makes things incredibly shaky, and you’ll quickly find that catching Pokemon is more enjoyable with the feature turned off. Catching Pokemon is a far more simplified process than in the main series, as there are no battles between Pokemon. Instead, players need to throw a Pokeball with a swipe of their phone, with their swipes helping to dictate whether the ball hits or misses the target. Some Pokemon may prove difficult to catch, in which case players may have to use items such as berries to help win them over. This streamlined Pokemon catching does remove much of the depth of the tried-and-true formula, but it works for the series’ transition to cellphones. As players catch Pokemon and find Pokestops, their trainer will gain experience points. As players level up they will be able to catch stronger Pokemon and gain access to better items. Upon reaching level 5, players gain access to one of the game’s three teams: Team Valor, Team Instinct and Team Mystic. By aligning with one of these teams, players are effectively allies to anyone else of the same team, with their goals being to maintain power over the aforementioned gyms. Gyms are in constant contention, with each team battling for supremacy. Should you be able to defeat a gym leader, your team then takes over that gym, and anyone else who belongs to your team can leave a Pokemon at the gym to help defend it from the opposing teams. Unlike the trainer, Pokemon do not gain experience points to level up. Instead, players are left to catching multiple Pokemon from the same evolutionary chain, which can be traded to Professor Willow in exchange for candy which can be used to level up Pokemon from that chain. So if you want a Charizard, be prepared to catch Charmander after Charmander after Charmander in order to get enough candies to evolve them to a Charmeleon and then finally to a Charizard. It’s a bit of a tedious process, but an addictive one as well. Another fun aspect to the game are Pokemon eggs, which are slowly hatched by walking. After finding Pokemon eggs, you can place them in incubators. So long as the app is on, your walking will bring your Pokemon eggs closer and closer to hatching. This, along with the constant searches for more Pokemon, makes Pokemon Go a game that not only encourages exercise, but requires it. Aesthetically, Pokemon Go looks and sounds pretty solid, especially when one considers this is a cell phone app and not the next main Pokemon entry on a Nintendo handheld. Though it can’t compete with the visuals and sound of the Pokemon titles on the 3DS, it does mimic them with some pretty impressive results. Not everything is great in Pokemon Go, however. The game suffers from some severe server issues, with total freeze-ups being an all too common occurrence. Worse still, these freeze-ups will often happen as you’re catching a Pokemon, and you won’t know whether you caught it or not until after you’ve exited the app and restarted it. Similarly, there are times when your character doesn’t move along with you, leaving you unable to interact with Pokestops and gyms even when you’re standing right in front of them. And you’re likely to run into lag issues at an annoying frequency. In the end, Pokemon Go is a fun and incredibly addictive experience, even if it is shallow when compared to the main series, and it is plagued by technical issues all too frequently. Still, Pokemon Go is a rare gaming experience that has – because of the social and physical activity it asks of players – become bigger than what the game itself provides. Also, Team Mystic for life!